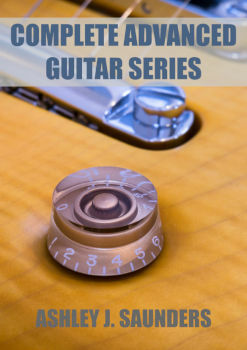 The Complete Advanced Guitar Series eBook is a collection of all 10 advanced series eBooks. If you have a solid foundation and want to grow your guitar player quickly, then this is only the advance guitar method ebook you need. If you want to move past the basics, then Complete Advanced Guitar Series eBook will help you to reach your goal. This ebook features the10 eBook in the advanced series. So, this advance guitar method ebook provides you with all you need to develop yourself as a guitarist. The first two sections (Beyond CAGED and Jazz chords) cover how to build chords all over the neck. Once you understand how to build chords, you'll never need another chord book! Plus you'll be able to find unique chord voicings for yourself. 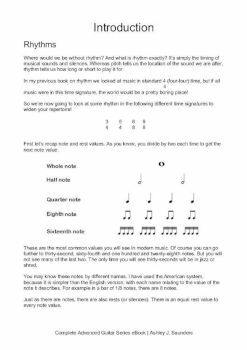 The third section, Rhythms in Odd Time will push you to internalise different time signatures through practising one, two and four bar rhythm phrases. The Blues (section four) underpins every type of music we play as guitarists, so we'll cover 12 different forms and endings. As well as common chord shapes. Sections five and six deal with Triads. These powerful threesomes are at the heart of every chord you use. As a guitarist understanding how and when to use Triads can unlock your playing. Fast Forward Your Playing, is section six and will help you discover your learning style. If you want to progress quickly without years of frustration then you need to understand how you learn. Section seven is all about finding Your guitar tone. We'll cover every piece of gear you'll use as a guitarist. From guitar's tonewood to the order of your FX pedals. Also, we'll talk about what to do on gigs when you can't use your own amp. Who says you can't have always have a great gig! 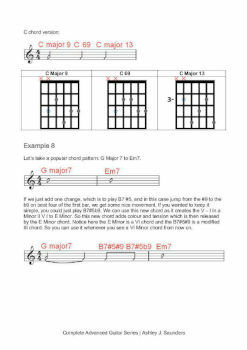 Soul Guitar is section eight and contains popular chords and licks used by today's R 'n' B guitarists. The last section Partial Chords covers advanced chord voicings across the guitar's neck and while it's a jazz concept, the ideas can be applied to a range of musical styles. 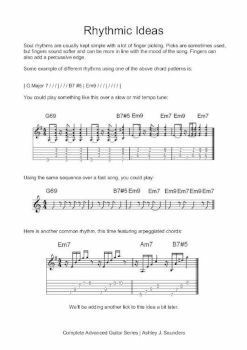 So if you're looking to develop your playing then this advance guitar method ebook is right for you! This eBook is aimed at those would like to quickly advance their guitar playing and already have a solid foundation.